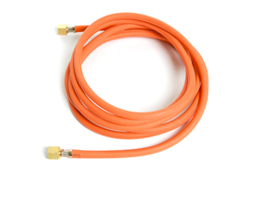 The Sievert propane hose contains three layers for safety: an inner layer of gas resistant rubber, a middle layer of reinforcing weave to withstand high pressure and an outer layer to protect against external damage, sunlight and ozone. Sievert hoses are also frost resistant and can be used in temperatures as low as -30ºC/-22ºF. Sievert high pressure hoses conform to ISO 3821 and EN16436-1 standards.